Learn karate, jujitsu, and self defense fundamentals, or practice Hatha Yoga in a comfortable, supportive, and very friendly environment. These benefits of martial arts training carry over to the school and work environments, helping students and professionals achieve their goals. I became a black belt in jujitsu this past year. Now that I have this training, I feel so much more confident among strangers because part of my training was in self defense. I would recommend Cormier’s to anyone. Jim takes all the precautions necessary to make the learning safe and there’s some fun mixed in there, too. You’ve had a profound effect on both of our children. I honestly believe karate improved their self-discipline and self-confidence. Thanks for all you’ve done! We really value Jim’s extensive knowledge and experience and his dedication to teaching his students. Jim takes a great deal of pride in his art and each student receives individual attention in every class. In addition to the physical karate skills our son is being taught, it is awesome to see he’s also learning so many life skills like responsibility, perseverance, respect, and assertiveness. See how Cormier’s Self Defense Academy can help you achieve your martial arts goals. 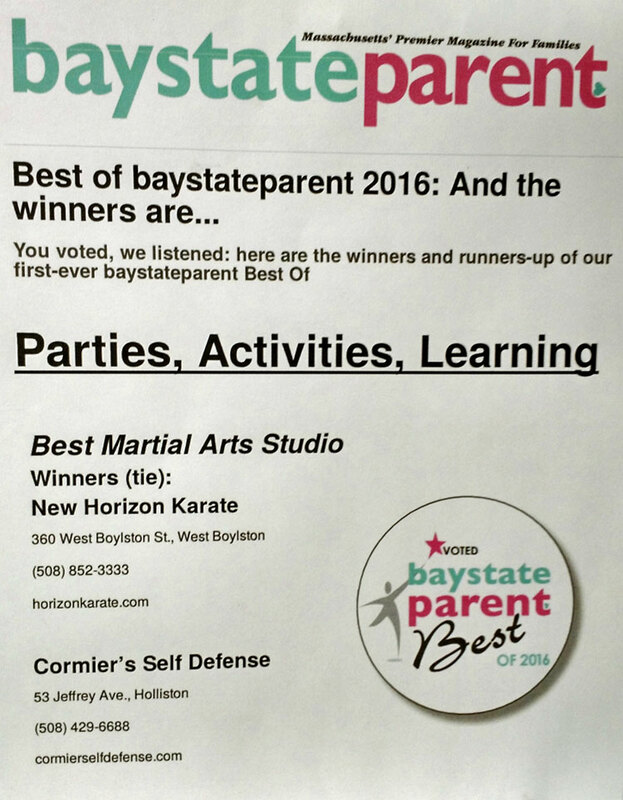 We welcome you to come in and join us for a complimentary introductory class and experience why our families voted us Best Martial Arts Studio in baystateparent Magazine’s 2016 Best of baystateparent Awards, Top 5 Martial Arts Classes in Massachusetts in Boston Parents Paper’s 2017 and 2015 Family Favorite Awards, and Best Martial Arts Classes around Boston in the Boston Parents Paper 2014 Family Favorite Awards.